The RG801 claddagh sterling silver ring from Kai Silver represents, one of the finest renditions of this historic and meaningful jewel. The ring is shown here as a lavendar jade ring in 925 silver but, you can request for your ring to be crafted in gold or silver. Jade is an interesting gem and is found in many colors green, blue, white, yellow and red are some of these. However in the ancient days, it was only green jade that people knew of and green is still the best known color of jade. As years, decades and centuries passed by, science came to identify and understand gemstones much more deeply. It became clear that lavendar jade, yellow jade and and green jade were all formed under natural conditions - the more important thing is that they are all jade. Jade is a sturdy gem and this toughness is derived from it's finely meshed fiber like structure. 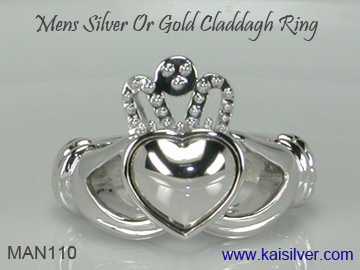 The Kaisilver gold and silver claddagh rings have the same fine craftsmanship and ensure that, the essential features of the ring are fully retained. It was four centuries ago that Robert Joyce, a humble Irish slave made the first claddagh ring. He made the ring to demonstrate his true love for his beloved, the features in the ring depicted his feelings. The hands in the claddagh jade ring denote friendship and togetherness, the crown was meant to prove his loyalty for her and the heart signified true and unconditional love. Robert was lucky to be freed from slavery a few years later, he rushed back to his village and gave the ring to his beloved. The couple were soon married and lived the rest of their life together. Interestingly the ring was named after the small fishing village (in Ireland) in which Robert and his beloved lived - the village was named Claddagh. Besides confirming to the specifications and details of the first claddagh ring, your kaisilver silver jade claddagh ring has some advanced and researched features. Notice the hands and fingers on the ring, they are crafted by some of the finest Asian artisans in Thailand. The flowing fingers show compassion and elegance, the same can be said about the entire ring. Most claddagh ring lovers who are aware of the story behind this amazing jewel, develop a close sentimental relationship with the jewel. You will therefore appreciate the many advanced features that we have incorporated into the design of our claddagh rings. Notice how the entire gem is bordered with metal, while keeping the jade firmly in place the border also, protects the gem from side impact. Since each jade piece is custom cut to precisely fit the finely crafted gold and silver claddagh rings, we ensure that the gem is provided with the right thickness. Keep in mind that a gemstone that protrudes significantly beyond the surface of a jewel, is more likely to hit against hard surfaces and get damaged. A good metal weight is an important requirement for a durable jewel, most jewels ignore this in order to keep metal weight and costs down. Your Kai Silver lavendar jade ring will have a healthy metal weight irrespective, of it being made in gold or silver. This does show on the price tag but we believe that, working on low price tags will invariably compromise the quality and durability of a jewel. The metal weight provided for the gold and sterling silver jade rings, keep the ring in shape and prevent it from bending or deforming easily. Most jewelers would make these jewels with metal weights that are at least, 40-60% less than what we provide. This might bring short term benefits in terms of lower prices but, in the long term you will spend frequently on repairs and replacements. As you would be aware, all silver tarnishes over time, a complex combination of factors related to the environment and moisture, cause this natural occurrence in silver. There is a belief that plating silver can prevent the metal from tarnishing, this is both true and false so do understand the implications. Plating your 925 silver lavendar jade ring, would temporarily prevent the surface of the metal from tarnish but, the plating will gradually wear off. A ring that is tarnished but never plated will be easier to clean and polish, as compared to a ring that has a plating which has begun to wear off. It is for this reason that we recommend no plating to be done on your silver claddagh jade ring. If you have understood this explanation but, still prefer to have your silver ring plated - we can provide white rhodium, yellow gold or rose gold plating. Custom made in gold or 925 silver, all ring sizes available. No limitation on the gemstone that you can select. The gold claddagh jade ring is available in 14k or 18k - white, yellow or rose gold. 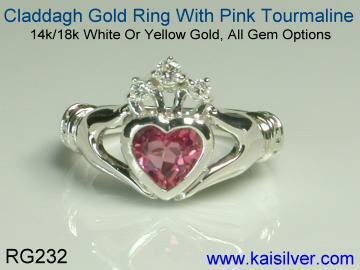 Request for a price quote if you need a 10k claddagh gemstone ring. We recommend that silver claddagh rings be left unplated, plating will not last forever. You can request for white rhodium, yellow gold or pink gold plating on 925 silver. The ring has advanced features to enhance durability built into the design. Both gold and 925 silver claddagh rings have fine craftsmanship, handpicked gems. Good metal weight is provided for gold and silver rings, ensures durability. 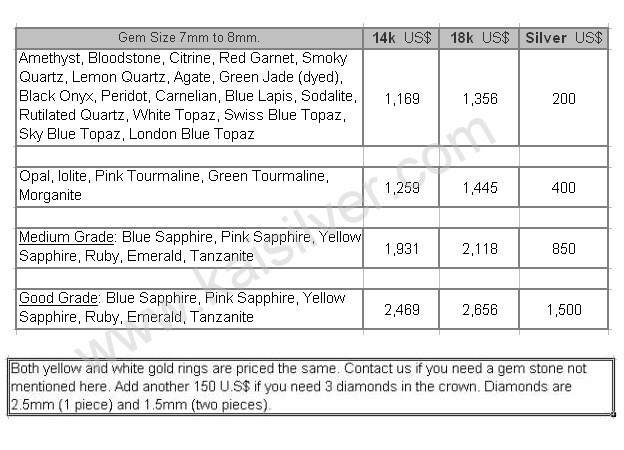 Pricing For Jade (Green And Lavendar) Is In The First Category Of Gems In The Table. Kaisilver: As the leading online high end custom jewelry provider, we craft gold and 925 silver without any limitation on design, dimensions or gemstones. More than 12,000 jewelry lovers spread over 17 nations, rely on us for their jewelry and gem requirements. Our expertise in gem procurement puts us in direct contact with almost every gem mining location in the world. And with preferential access to over 200 million carats of cut and polished gems, we do not place any restrictions on your gem selection. By using the same team of skilled artisans and gem cutters to craft both gold and 925 silver jewelry, we prove our commitment to quality irrespective of the metal selected or the price point of a jewel. Our support experts at sales@kaisilver.com will be glad to help you with any questions or requirements that you might have. You can also send us your own design ideas to be custom made. Buying: If you wish to buy this silver claddagh jade ring or any gem or jewel from Kaisilver, please discuss your requirements with our team. Do not be in a hurry to buy until you have received complete information regarding the item. Production time is around 4 to 6 weeks from the date that we receive payment. We accept Paypal and Western Union as modes of payment but, recommend Paypal for first time users. You can let us know which mode of payment you prefer and the team will provide you with details for the same. Shipping: We ship through FEDEX with web tracking service, this method gives peace of mind to both you and us since, the parcel can be tracked online all the way to your doorstep. Please add another 35 U.S$ to the above prices to cover the cost of shipping. Gorgeous claddagh diamond ring with a pink tourmaline gemstone. A perfect rendition of the 4 century old claddagh ring, your choice of gemstone. Available in gold or 925 silver with all gem stone options ... more. An impressive and sturdy men's claddagh ring with no gemstone. The ring is comfortable to wear and crafted in gold and sterling silver. Lack of gem makes it easy to clean, wear and maintain this man claddagh ring ... more.